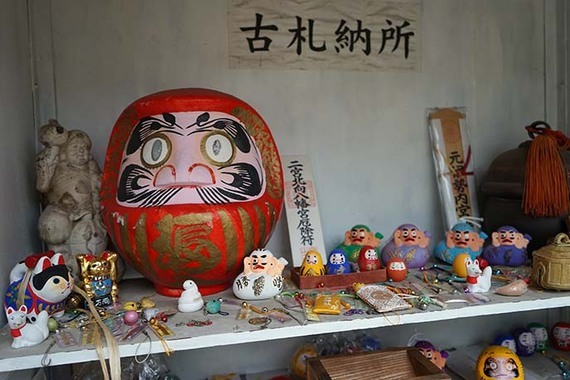 Japan is a wonderful destination for travelers who love art and culture. These local expressions range from pop culture cute to traditional Shinto architecture -- all with a quintessentially Japanese feeling. I was keen to discover the creative scenes of five very different cities, so I traveled throughout the country with a Japan Rail Pass. With my unlimited pass, I could hop on and off the bullet and JR trains for a week, which turned out to be excellent value. 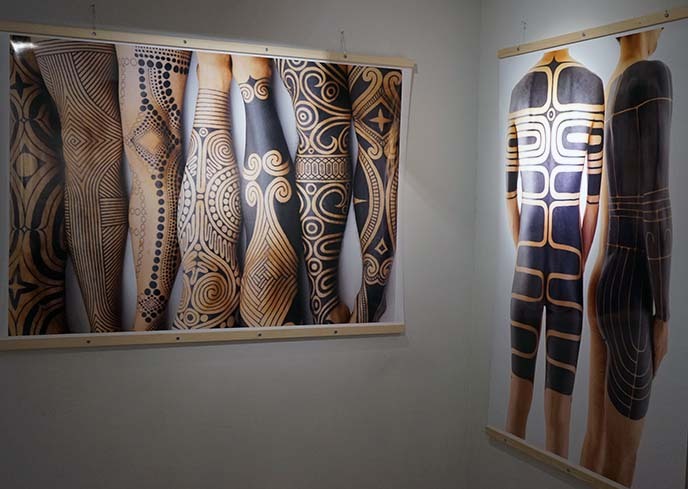 I started my art-themed journey in Tokyo, where I checked out an edgy tattoo exhibit. I then visited Kyoto's iconic Shinto shrines, and walked through Buddhist cemeteries in Mount Koya. I ended my rail trip in Osaka, where I dove into the underground art. Here's a guide to the art I discovered in each city, as well as a travel video about my journey. I began my trip in Tokyo, where I stayed in the art-filled Park Hotel. Their "Artist Room" project transformed all of the rooms on the 31st floor into works of art. 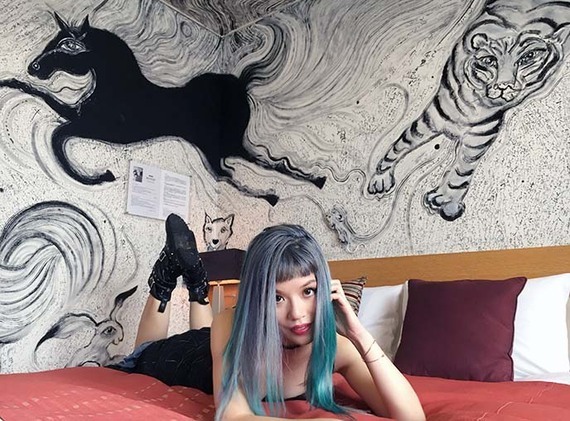 Each room is decorated by a Japanese artist, and inspired by some aspect of the local culture. The resulting themes include "Zen," "Lucky Cat" and "12 Signs of the Zodiac" (pictured above). The experience felt as if I were staying in a gallery. 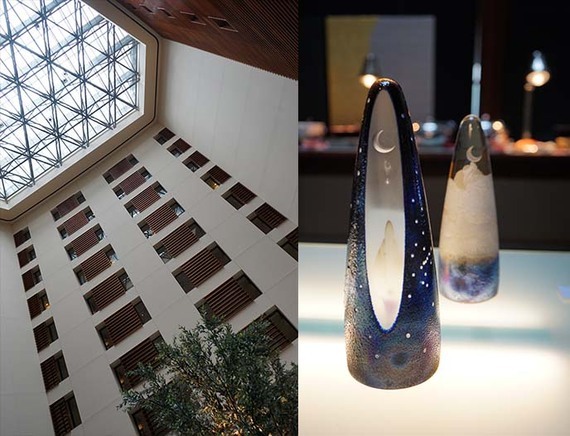 At Park Hotel, the most unexpected spaces transform into art, such as a breakfast spread next to crystals reminiscent of Sailor Moon. The lobby design also features a prismatic atrium, with rotating exhibitions and light projections in the evenings. I met up with my friend Ryoichi Keroppy Maeda, who is a pioneer in body modifications such as bagelheads (saline forehead inflation). His latest project was a photography exhibit at Tav Gallery, in collaboration with tattoo artist Taku Oshima. Their images show tattoos based on tribal patterns from the Jomon era (300 BCE), which challenge the stigma against tattooing in Japan by giving it a historical and artistic context. In Tokyo, I was also charmed by the "kawaii" cute designs found all over the city. In Harajuku's "Line Friends" shop, I found this minimalist lamp by Mr. Maria, which looks like the bear mascot Brown. I decided to continue my quest for Japanese art by train. I ordered an unlimited one-week J Rail Pass, which enabled me to visit four more cities at a lower cost than if I bought individual tickets. 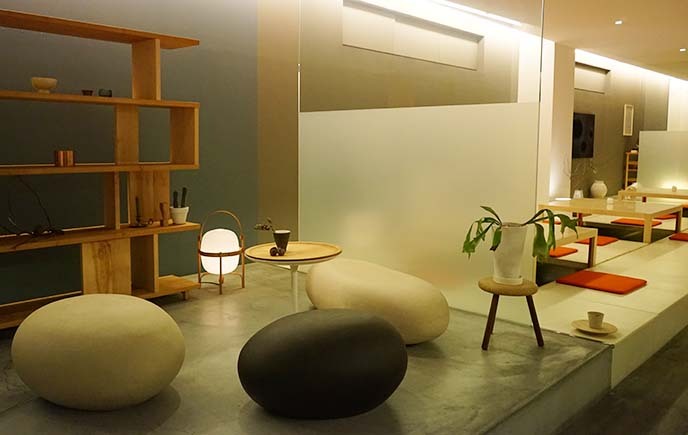 I looked for a design hotel to reflect the theme of my trip, and found the lovely Hotel Gracery Kyoto. 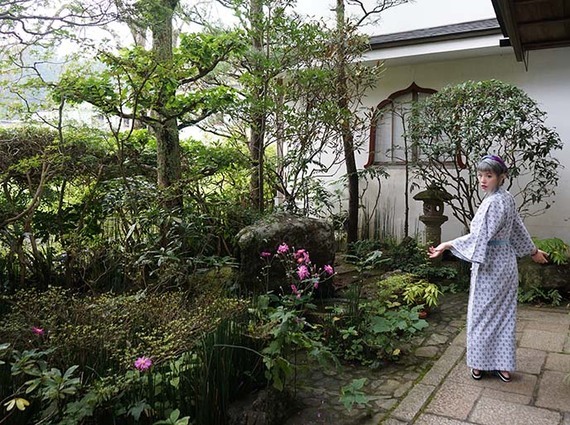 Their Kabuki room is designed to reflect the theater culture of Kyoto, complete with paintings of the performers in kimonos, and red lanterns over a bedspread dotted with cherry blossoms. With nearly 2000 Buddhist temples, 500 Shinto shrines and world-class art museums -- all remarkably well preserved -- it's easy to understand why Kyoto is considered the spiritual and cultural center of Japan. I wandered through hidden temples and Zen gardens all over the city. I made my way to Fushimi Inari, the head shrine of the Shinto god who is served by fox messengers. It was a joy to walk through the mountain pathway, under thousands of orange-red torii gates. Kyoto's ancient structures are a must-see, but the city also has an innovative art scene. I enjoyed drinking a matcha in the futuristic Sfera building, which houses a design shop and museum. The contemporary Zen interiors gave me plenty of inspiration for my apartment decor. In less than two hours by train, I had arrived in laid-back Kobe. I walked to Ninomiya Shrine, a small and peaceful place for contemplation. Locals left colorful lucky cats (maneki neko) and daruma dolls (representing the Bodhisattva Bodhidharma) on a shelf, as offerings of good fortune. I rode the cable car up to the mountains of Koyasan, and fulfilled one of my travel dreams: to do a "shukubo" stay with Buddhist monks. I lived in a simple yet beautiful guesthouse, where I ate vegetarian meals in the dining hall, and watched the Shingon monks chant in the early mornings. 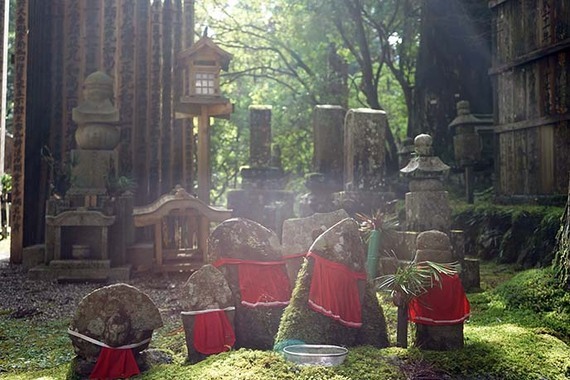 I strolled through the ancient graveyard, Okonoin, which had tens of thousands of tombs and Buddha statues covered in moss. Many of the stones were lovingly dressed in red hats and bibs. One evening, I watched a procession of monks through Okonoin cemetery, followed by a ritual involving incense, candles, bells and chanting. I ended my train journey in Osaka. I spent a day in Amerikamura, the hub of youth and alternative culture, where I browsed vintage and design stores. My favorite was Territory, a fascinating occult store run by DJ Taiki. 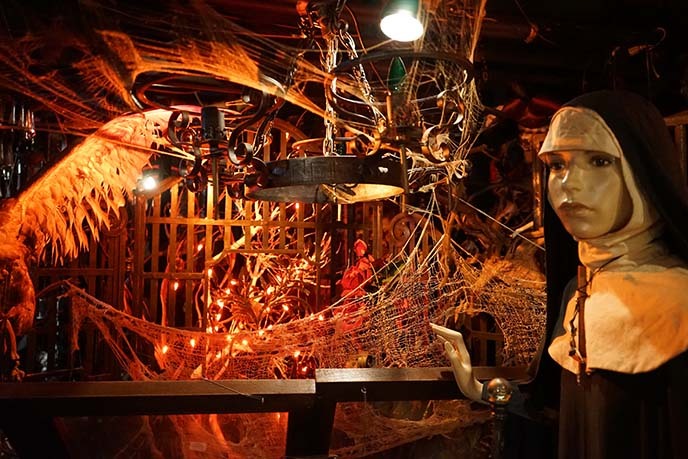 Every inch of the space is brimming with Gothic statues, taxidermy and other oddities. 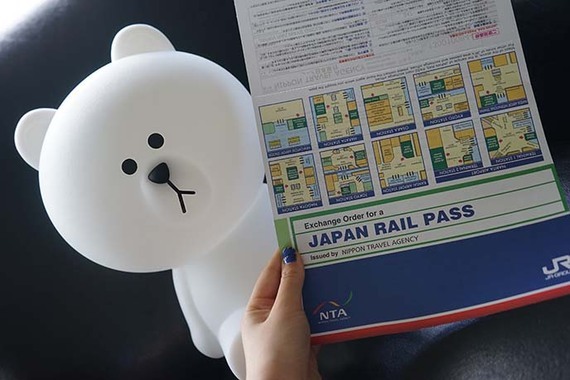 See more from La Carmina's J Rail Pass travels in her video. 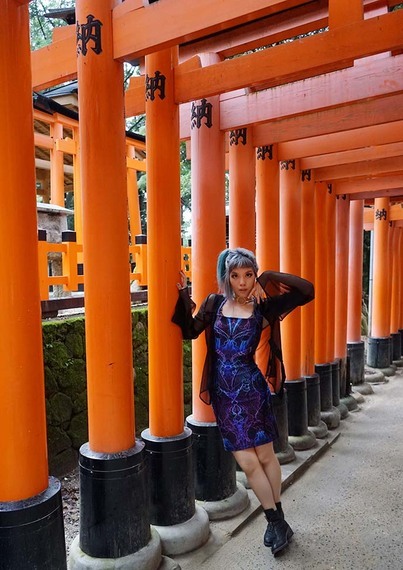 Enjoy more Japan travel tips on LaCarmina blog, and follow her on Instagram @lacarmina.